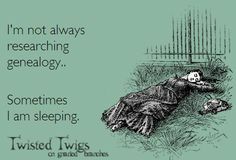 There are many family trees posted to the big genealogy websites. My personal opinion about these trees, in relation to my own research, is they should be used a hints. I always try to contact the tree owner to see if they have any sources of their information. I am cautious about the online trees but I am also optimistic. Towards the end of the summer, I received a hint about my grandfather’s family on My Heritage. I took a look at the family trees posted and noticed a sister named Anastasia Adele Ciardonei was part of the family structure. My grandfather, Celio Capelli, immigrated to the United States in March 1920 at the young age of 5 after the death of his mother, Adele Siletto. Upon the ship’s arrival in New York, my great-grandfather, Matteo Ciardonei, was detained at Ellis Island after being diagnosed with tuberculosis. My grandfather’s aunt (Adele’s sister) Mary Siletto Capelli, traveled from Pittsburgh, Pennsylvania to pick up my grandfather from Ellis Island. Matteo was deported back to Italy and Celio became part of the Capelli family. Sadly, Matteo passed away a little over a year later in Cossano Canavese, Italy. My grandfather grew up in Pittsburgh in the home of his Aunt and Uncle, Mary and Frank Capelli, with his cousins as his siblings. I had heard a story that Adele Siletto had passed away in childbirth. I considered this story very likely to be true. When reviewing the family trees at My Heritage, it seems I had finally might have proof of this story. I contacted a friend on Facebook, Lily, who lives in Cossano Canavese, Italy. You can read about how we were introduced and the wonderful presents she gave to me here. I had received the church death record for Adele Siletto from Lily last year. What I did not know at the time was to ask if there were any records for this possible sister, Anastasia Adele. I asked Lily to take another look at the church records to see if there was a birth record for Anastasia Adele Ciardonei in the same month Adele had passed away. Lily became my hero once again when she sent a digital copies of Adele’s death record and Anastasia’s birth and death records. Adele Anastasia Antonia Ester Ciardonei was born on 12 September 1919. Her mother, Adele Siletto, passed away a few days later on 18 September 1919. Anastasia was baptized two days after her mother’s death on 20 September 1919. Sadly, she did not survive and passed away when she was 29 days old on 10 October 1919. Just 5 months later, Matteo and Celio would be on a ship steaming towards the United States. My heart breaks for Matteo Ciardonei. In less then a year he loses his wife and newborn daughter, tries to reach a better life in America but is deported, and leaves his son with family on another continent. I am also so eternally grateful for the decision he made to leave my Grandfather with Mary and Frank Capelli. I want to send a huge Thank You to my extended Italian family who placed Anastasia’s name on an online family tree. Without their help, I would not have been able research this important story in my family history. Every piece of the story adds up to explain how so many decisions came to be. In my last post, I told my story of how social media led me to some important documents for my Italian line. You can read about it here. 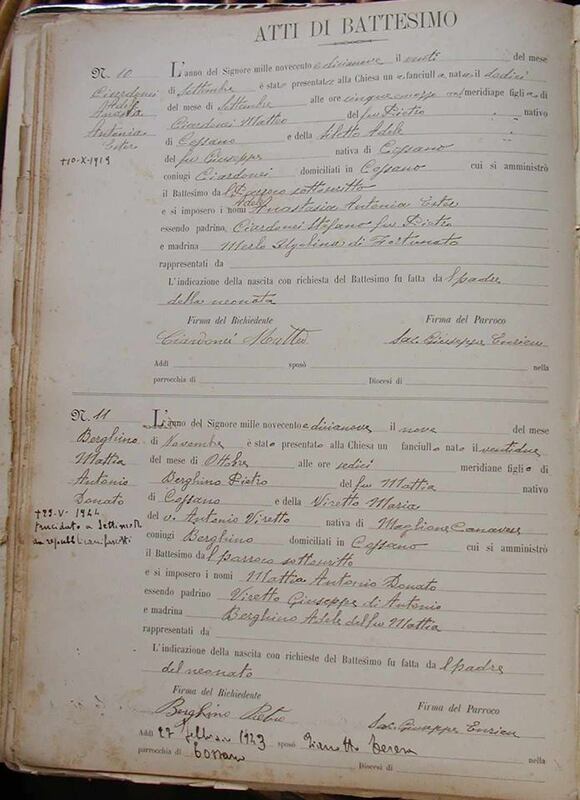 The first document is the marriage record of my great-grandparents, Matteo Ciardonei and Adele Siletto. 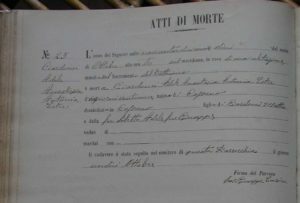 Ciardonei Matteo, twenty-four, native of Cossano, living in Cossano, son of the deceased Pietro, who was son of the deceased Matteo, and son of the deceased Ciamporcero Antonia, daughter of the deceased Stefano. And Siletto Adele, twenty, native of Cossano, living in Cossano, daughter of the living Guiseppe, who was the son of the deceased Stefano, and daughter of the living Maglione Anastasia, daughter of the deceased Giacinto. My father’s paternal line is purely Italian. My Grandfather immigrated to the United States when he was five. I have written about his journey to the U.S. (you can read them here and here). I was lucky to find a roll of microfilm at the Family History Center which included all the baptisms, marriages, and deaths from the very small town my grandfather was born in. I am so thankful I paid the extra fee to have the microfilm on extended loan. When I began looking at the microfilm a couple of years ago, I focused on my direct ancestors and the documents I could find for them. Because the film is still at my local Family History Center, I can go back and fill in the gaps in my research – siblings! My plan of attack is simple. Using an excel worksheet, I am documenting every baptism for the surnames Ciardonei and Siletto. My excel worksheet includes the following columns: last name, first name, birth year, birth month, birth day, father’s first name, father’s last name, son of, mother’s first name, mother’s last name, and daughter of. Below is an example from my excel worksheet. The two lines in bold are my great grandparents. My worksheet is now neatly sorted into family groups! I have added an extra blank row between family groups to make it easier to read. By sorting the families in this manner other relationships are starting to become clear. In the example above, it is highly likely that Pietro and Stefano are brothers since they are both sons of Matteo. I should be able to confirm this relationship by looking at the marriage records for both men and checking to see if names of the parents match. It is interesting to also note how closely these families followed naming conventions. First son is named for the paternal grandfather. First daughter is named for the maternal grandmother. I have already collected information from 1899-1865. I need to make another trip to the Family History Center to finish the remaining 8 years to 1858. 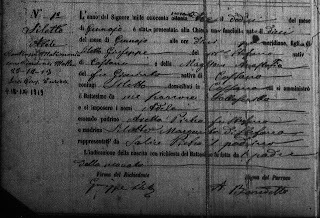 As I have worked my way through the baptism records, I realize that I need to also do the same project for the last names Maglione and Ciamporcero to see if I am able to identify any siblings of my great-great grandparents. Once I am done with the baptism records, I will repeat this project using the marriage records. 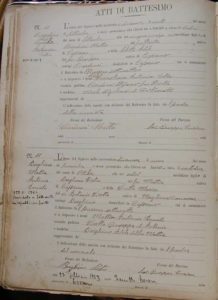 The baptism records go back to 1858. The marriage records extend back to the early 1800’s. I was blessed to receive a book about Cossano Canavese, Italy from a genealogy friend who visited Cossano last year. My Dad’s paternal line is from this small town outside of Torino. I have had the book for six months but really have not spent much time looking at it yet. The reason why is the book is in Italian and I speak English. The section I concentrated on was several pages before a photo of my great-great-grandfather, Giuseppe Siletto. The translation roughly spelled out the creation of the post office in Cossano. Before 1856, the town was dependent on the nearby town of Caravino for its mail. In 1858, a letter was sent to all mayors in the province letting them know that they needed to assign someone the job of postman and decide how often that person would go to Caravino to pick up the mail each day. The new postmen would receive 50 lire a year for their work. The Mayor of Cossano named a certain man named Siletto for the job and it started 1 January 1859. 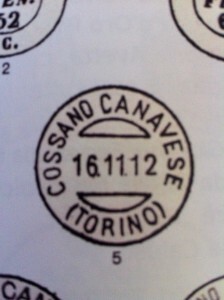 In 1912 Cossano became its own post office and was no longer dependant on the town of Caravino. In the page before the photo of my g-g-grandfather is a stamped certificate to record a deposit of 200 lire in September 1893 by Giuseppe Siletto to carry out the functions of postal carrier. 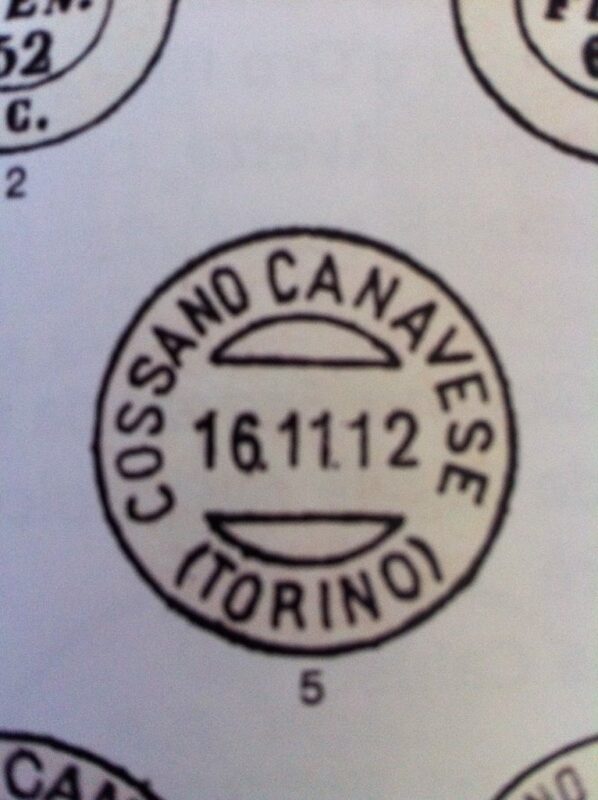 So it turns out that my ancestors owned and operated the post office in Cossano for a very long time. From 1859-1893 a man by the same surname ran the post office. My g-g-grandfather, Giuseppe Siletto, owned and operated it from 1893-1912. His daughter, my great-grandmother Adele Siletto, was the owner from 1912 til her death in 1919. Giuseppe’s second wife, Lucia Brunero, was the postman from 1915-1925. And Lucia’s son from her first marriage, Giovanni Antonio Brunero, was the postman from 1925-1966. Adele Siletto is my paternal grandfather’s mother. She was born in Cossano Canavese, Piedmont, Italy on January 10, 1893. This image was scanned from the FHL microfilm I have been researching ( Registri Ecclesiastici di Cossano Canavese (Torino), 1651-1899). The year of the lord one thousand eight hundred ninety two the twelfth of January was presented to the Church an infant born ten of January at ten pm, daughter of Siletto Guiseppe, son of living Stefano, native of Cossano, and daughter of Maglione Ana Stasia, daughter of deceased Giacinto, native of Cossano, of the family Siletto live in Cossano to whom the baptism was administered by ??? the delegated priest, and to whom was giving the name of Adele, the godfather being Avetta Pietro, son of deceased Stefano and the godmother Siletto Margarita, daughter of living Stefano. Represented by ? Pietro ?? The indication of the birth, with the request for baptism, was made by the underwritten father of the infant. That tingle of excitement is back! There was a self addressed envelope in the mail today. I want to repeat just how much I love these envelopes. I now have a death certificate for Salvatore Siletto. To refresh your memory, Sal Siletto is my grandfather’s, Celio “Jay” Capelli’s, uncle. His wife, Anne, was a witness in my grandpa’s naturalization paperwork. Since Siletto is the maiden name of my great-grandmother, I asked family if there was a connection. My grandmother confirmed that Sal was the younger brother of grandpa’s mother, Adele. I now know that Sal immigrated to the United States in March 1921, he became a naturalized citizen, and was a baker in Pittsburgh. Sal’s passenger manifest listed his mother as Dominica Brunero. I also found a 1938 passenger manifest entry for a Lucia Siletto Brunero who was going to visit her son, Salvatore Siletto in Pittsburgh, Pa.
Sal’s death certificate confirms most of the information I have already found. His wife was Anne Bordone. He was born 17 December 1900 in Italy. He worked as a baker and lived in Pittsburgh, Pennsylvania. The death certificate also lists some new information. Sal died 27 July 1967 of carcinoma of the lung. He is buried in Calvary Cemetery, Pittsburgh, Pennsylvania. The best part is that Sal’s parents are listed as Joseph Siletto and Lucia Brunnero. I now have indirect evidence that proves Salvatore Siletto is my grandfather’s uncle. I am so excited that I have made so much headway in researching my grandfather’s family. I have another piece of the puzzle since Sal was not listed in the baptism records from Cossano Canavese, Italy. The church records only went through 1899. This blog post is being posted a couple of weeks after the fact. I found this information a couple of weeks ago but life and some medical issues got in the way and I was not able to share this great information with you until today. Please enjoy because I am still as excited today as I was on Tuesday, November 1st. My grandfather is Celio “Jay” Capelli. He was born to Matteo Ciardonei and Adele Siletto. 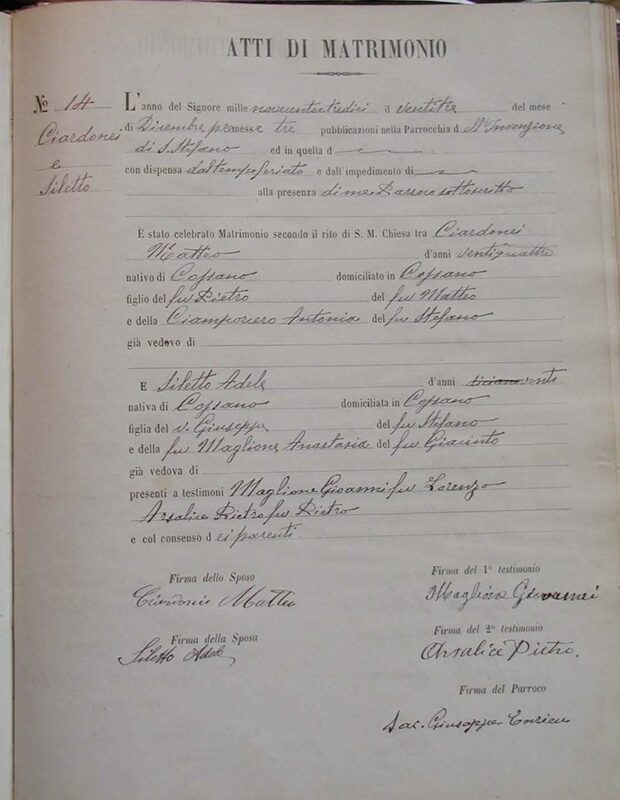 I have chronicled my grandfather’s story in several posts this Summer and Fall (an american dream, new documents add to the story of my grandfather, those places – cossano canavese, piedmonte, italy, and finding all 16 g-g-grandparents). My grandpa’s family are the last hold outs in my quest to find the names of all 16 g-g-grandparents. 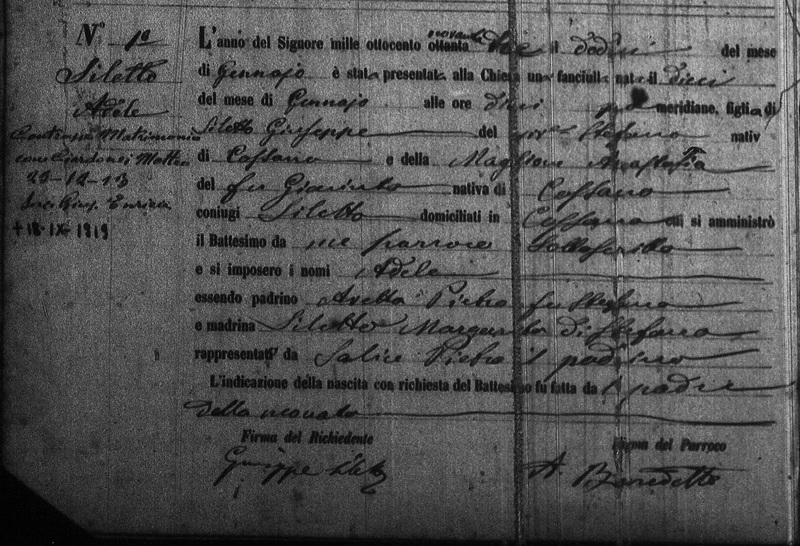 When we returned home from our wedding adventures (wedding wednesday – creating genealogy), I immediately logged on and ordered from FamilySearch.org the microfilm that contains the church records from Cossano Canavese, Piedmonte, Italy. The Family Search index shows that the records contain baptisms from 1858-1899, marriages from 1651-1899, and deaths from 1669-1899. The microfilm has arrived and I got a chance to look at the baptisms. I am very happy that I did my homework and showed up with a cheat sheet of words in Italian. It saved a lot of time in acclimating to another language. I had great success! I found the names of my missing g-g-grandparents! I started by scrolling through the microfilm to see how it was organized. Quickly, I found that for each year there was an index of names, birth dates, and certificate number that showed up at the end of the year. In this small town there was anywhere from 10 to 43 baptisms each year. There are about 10 main surnames that appear in the baptism records. Working backwards from 1899, I found Adele Siletto first. 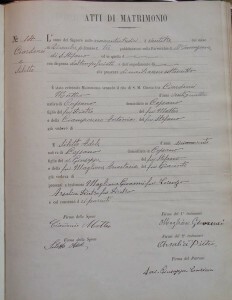 Her baptism record says that she was born 10 January 1892 to Guiseppe Siletto, son of Stefano and Ana Maria Maglione, daughter of Giarindo. I was really excited to see that someone in the church had added additional information to her baptism record by hand underneath Adele’s name. It also stated that she married Matteo Ciardonei on 25 December 1913 and died 18 January 1919. 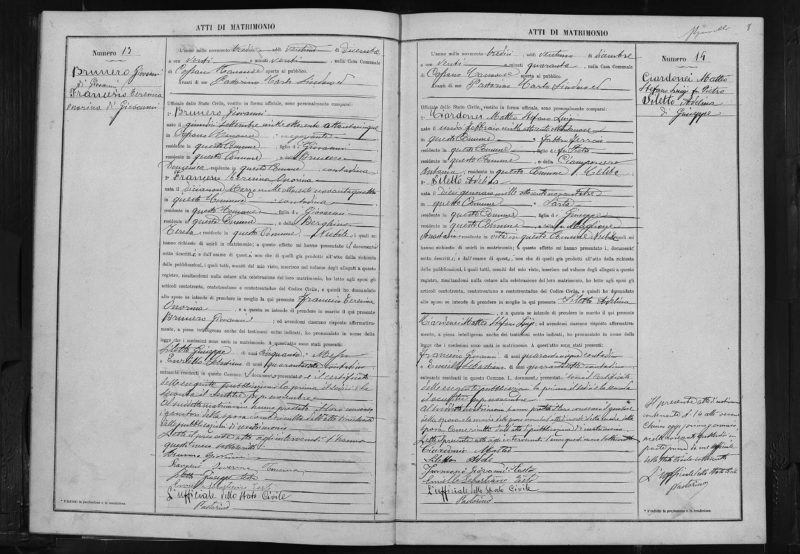 I found Matteo’s baptism record next using the index of names for 1889. Matteo Stefano Luigi Ciardonei was born 12 February 1889 to Pietro Ciardonei, son of Matteo and Antonia Ciamporcero, daughter of Stefano. Again, additional information was hand written in stating the same marriage date and confirming the date of death as 14 March 1921. I still can’t believe it. I only wish that my grandfather was still alive to hear all about it. I am excited to get back to the library this week. My plan is to create an Excel sheet and transcribe the index pages for the baptisms. Since this is a small town, it will not be too much work and will hopefully help untangle the web of families later. I can then go through the baptisms for the Ciardonei, Siletto, Maglione, and Ciamporcero families to identify any siblings for Matteo, Adele, and their parents. I will tie in the marriage records as I identify parents for each family group. I do not plan on looking at the death records until I am done looking at the baptism and marriage records. I have written a couple of times about my grandfather, Celio “Jay” Capelli. He was born Celio Ciardonei in Cossano Canavesse, Turino, Italy on December 31, 1914. His parents were Matteo Ciardonei and Adele Siletto. On March 22, 1920, Celio (5 years old) and his father, Matteo Ciardonei, arrived in the United States on the SS Dante Alighieri. According to the ship’s manifest, Matteo was deported March 31st because he had been diagnosed with tuberculosis. This information came from the passenger manifest found on Ellisisland.org almost 10 years ago. I got a printed copy for my Grandfather for Christmas about 8 years ago. 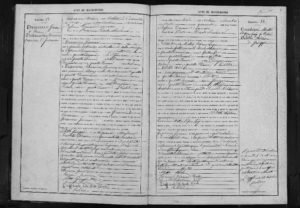 Yesterday, with the free access to immigration records at Ancestry.com, I found another piece to the story. Since I do not have a digital copy of the passenger manifest, I did a search for the last name “Ciardonei.” I was surprised to see several entries for both Celio and Matteo. When I opened each digital image, I realized that they had been included on additional lists in the ship’s paperwork. Specifically, the Record of Aliens Held for Special Inquiry and the Record of Detained Aliens. The Record of Aliens Held for Special Inquiry states that 31 year old Matteo was hospitalized upon arrival and given a “tuberculosis cert” designation. He was deported on April 12th at 1:45 pm on the SS Guiseppe Ver??an. Celio was admitted to the U.S. on March 31st at 10:55am. These documents made me very sad last night. I had known that Matteo was brave and left his son with his sister-in-law when he was deported. I had never considered what had occurred between the time Matteo and Celio arrived and when Matteo was deported. It must have been so scary for a 5 year old to be separated from his sick father and be detained for a week. He did not know any English at the time so communication must have been difficult. The only glimmer of hope that I see in these documents is that my grandfather was detained for only 8 days (as indicated by the number of meals). His ship arrived 10 days prior to his release leaving us with a 2 day difference. I am hoping that he got to spend the time with his father in the hospital during those 2 days. It would have been the last times they would see each other. 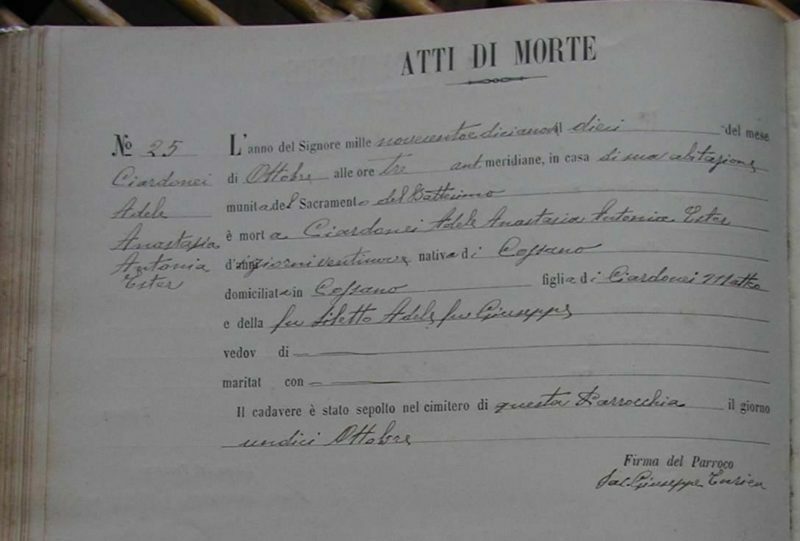 Matteo died in his hometown in Italy just under a year later on Mar 14, 1921. I will end on a positive note. I also found a Lucia Siletto Brunero on a passenger manifest in 1938 last night. She listed that she would be visiting her son, Salvatore Siletto. I have previously documented that “Sal” is my grandfather’s uncle. So it seems that my grandfather got to visit with his grandmother when she came to visit in Pittsburgh, Pennsylvania. It would have been the first time he saw his grandmother in at least 18 years. I have written a couple of posts about my paternal grandfather, Celio “Jay” Capelli. He was born Celio Giuseppe Ciardonei on December 31, 1914. His parents were Matteo Ciardonei and Adele Siletto. They lived in Cossano Canavese. It is a small town northeast of Torino in the Piedmont region. In May 2006, I got the chance to drive through the town that my grandfather was born in. Unfortunately, the visit was not a research trip. We drove through on a Sunday and everything was closed including the local cemetery. I hope to spend some time in Cossano Canavese one day. Here are a few pictures from that trip. Entering the town from the North. The main street through town is very narrow. The church is the tallest building in town. View of town from the South. These stones lined the road leading to the cemetery. All of the stones match the names listed on the plaque in town. I believe that this stone is a memorial for my great grandfather, Matteo Ciardonei.